"It's like eating dessert for breakfast! 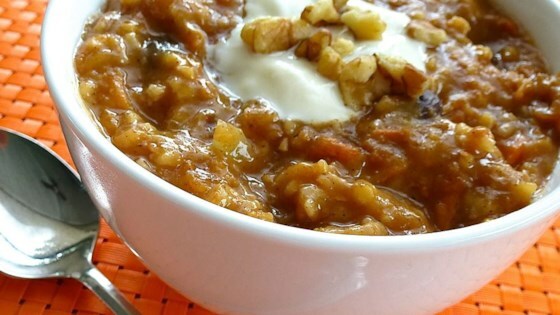 Even picky breakfast eaters will love this oatmeal! Freezes and reheats well." Combine water, applesauce, oats, carrots, pineapple, raisins, sweetener, cinnamon, pumpkin pie spice, and salt in the crock of a 7-quart or larger slow cooker. Spiced carrot cake for breakfast! 5 stars. Delicious and healthy. I halved the recipe though and added more cinnamon and raisins. Great for before school healthy breakfasts. Perfect!! I used regular applesauce and zero sugar.